As I sit, I notice the mosquito bites on my ankles are itchy, I feel my shoulders and neck are sore, and I see that I missed some dirt between my toes. 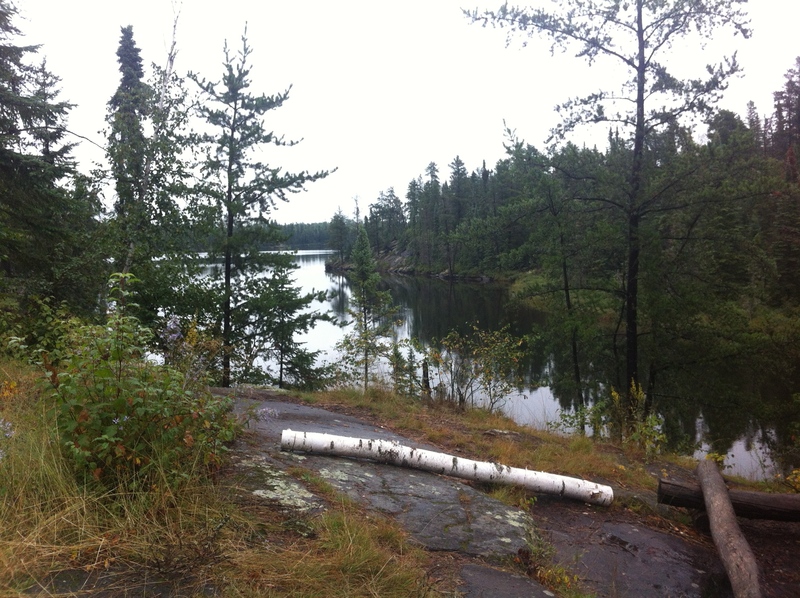 The reason why is because I just returned from Minnesota’s Superior National Forest: The Boundary Waters Canoe Area. 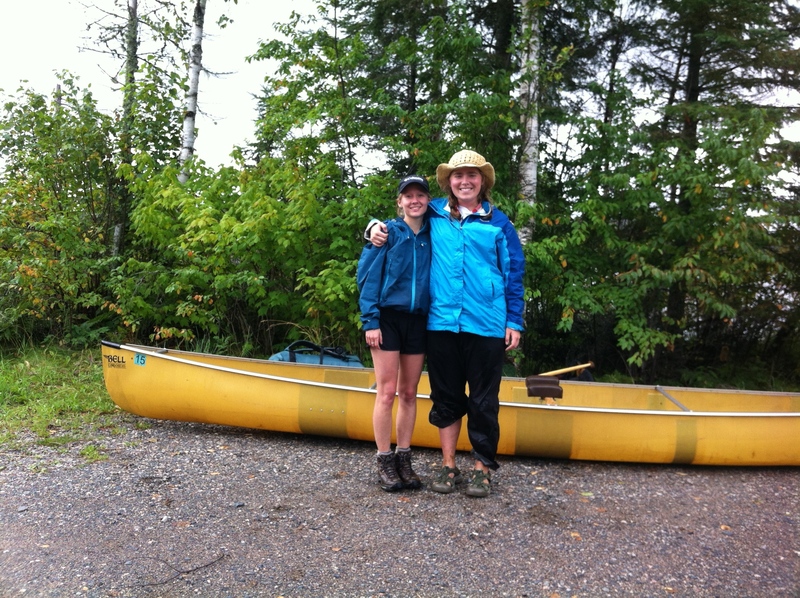 I went with my roommate and friend, Laura, who is well versed in the BWCA. 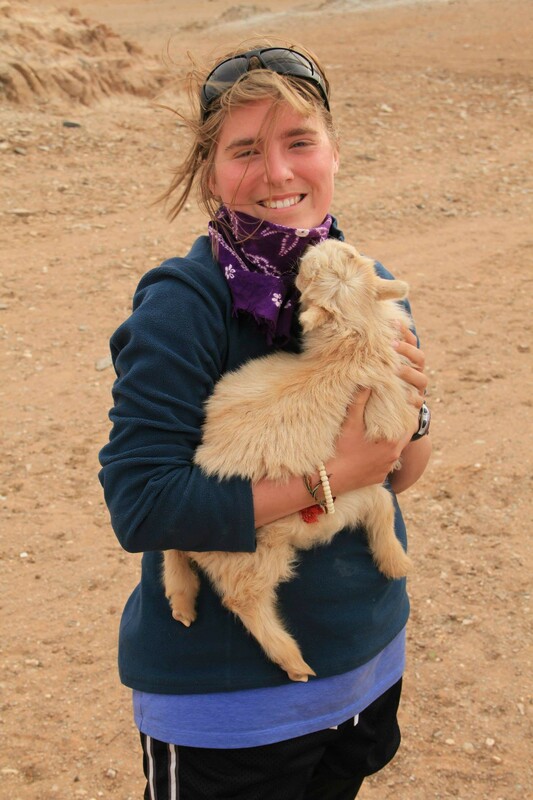 She spent 4 summers leading trips through Camp Widjiwagan. So, she was a great companion, especially since this was my first time ever in the Boundary Waters. We left Thursday evening after Laura got off work and just to give you a general idea, strapped onto the roof of my car was a 17-foot Northwind canoe by Bell Canoe Works. In the trunk was a Granite Gear Portage Pack packed full of the essentials: our tent (Sierra Design LT Strike 2), 2 sleeping bags, 2 sleeping pads, a tarp, a water filter, a camping stove, and our food. I also brought a daypack. Overall, we packed pretty light (except when you put on the portage pack, you thought otherwise). We drove up to Grand Marais and spent the night with a nice fellow named Derek. He is a couchsurfer, which means I found him through couchsurfing.org. (If you don’t know what I’m talking about, then you should check the site out!). We woke up nice and early, filled up on eggs and sausage, picked up a “world-famous” donut from World’s Best Donuts, and then we were off to find Round Lake, which was our entry point to the BWCA. 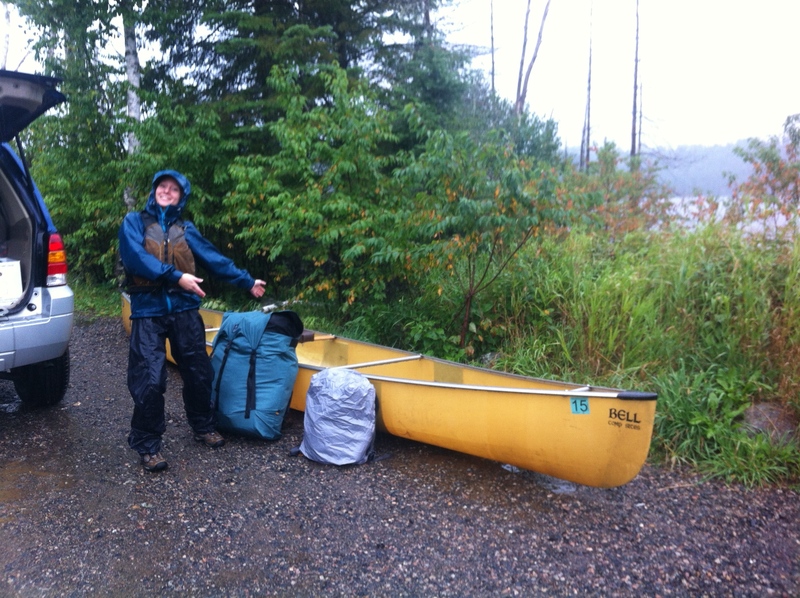 It was raining when we got onto the Gunflint Trail. We drove for 40 minutes and followed the signs to Round Lake. We unpacked the car, took down the canoe, and within a short time Laura and I were ready to go! When we set off on Round Lake, I could tell pretty quickly that my paddling muscles were small or non-existent. It had been a while since I had last paddled a canoe. Laura on the other hand, she was a powerhouse. During the next few days, Laura would be my canoeing sensei. Laura also made me the map lady. I’ve done orienteering before and I feel comfortable looking at a map, but I had never orienteered with a canoe. In my past backcountry endeavors, we would have to detour and avoid lakes, since humans can’t walk on water. But, with a canoe in hand, you can do anything your heart desires and that was a very cool realization. I felt powerful in a way. Maybe it is because I can defy nature or something. 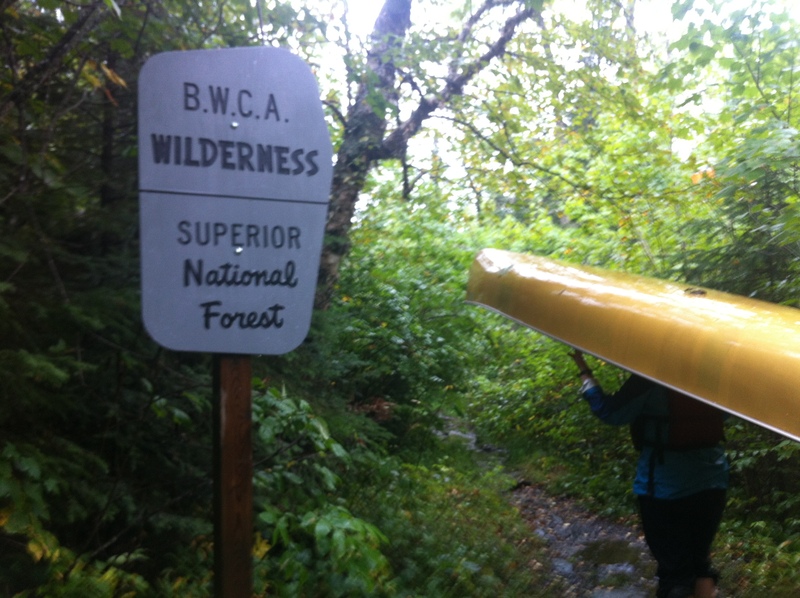 To enter the BWCA, you have to paddle and portage in. You can’t enter by car. We paddled across Round Lake and found our first portage. For people who do not know what a portage is, it is a trail that connect two lakes. You can also use portage as a verb, which means you carry all your gear across the portage itself (Does that make sense?). We unpacked the canoe and decided we would take two trips. I wanted to try carrying the canoe, so with teamwork, Laura and I flipped the canoe onto my shoulders. I had trouble balancing the canoe at first (which we learned later was because the shoulder pads were too narrow for my shoulders and I had them too far forward). I continued anyway, using my arms as leverage and trying to use my core to balance. The portage was 142 rods, which means it is 142 canoe lengths. Calculated into miles, that’s a little less than half a mile. I carried it about halfway and then needed a break. During the first portage, it started to rain even more. We were thinking about doing a second portage that day, but Laura told me that we should find a campsite earlier than later because the better campsites get taken very quickly on rainy days. 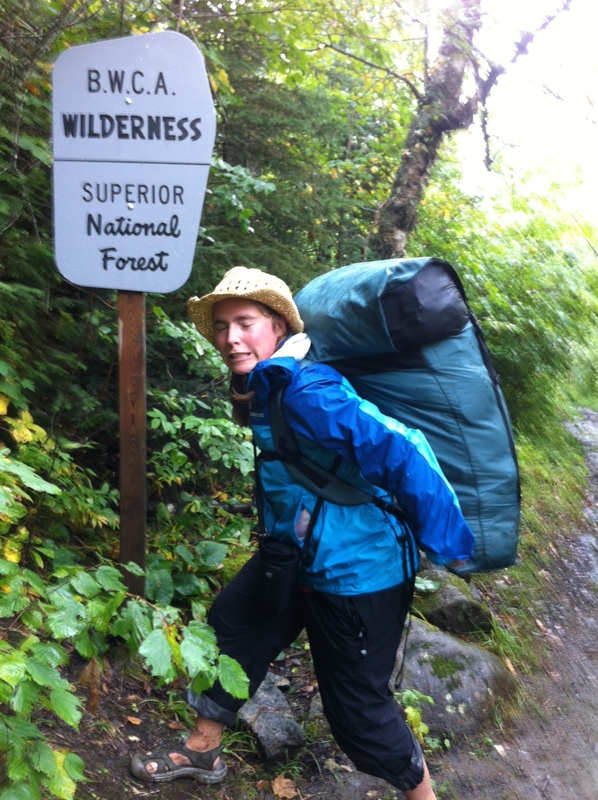 I followed her advice, so when we reached Missing Link Lake, we located the 3 available campsites. One was empty, but not optimal for rainy weather. Another was already taken. As we paddled to the third and final campsite, a loon graced us with his presence. The loon glided right by us and sang his loon song. I had never seen a loon so close. We found the third campsite and chose it because it had tree cover and a nice view of the lake. We unpacked our gear and rested for a little bit. It was still raining and Laura was pretty cold, so she went into the tent to warm up. By this time, the rain had subsided, so I tied some p-cord in between 2 trees to hang up our wet clothes. I also decided to look for twigs to use in a fire. I knew most of them would be wet, but I wanted to at least try. I found some decent ones and by around dinnertime, I had found enough dry kindling to make a small fire. My fire making skills impressed Laura, even naming me a “fire whisperer.” I would say otherwise, but I’ll take what I can get. For dinner, we cooked sausages. When we finished our food, we cleaned the dishes and repacked all of our uneaten food into a bag. We didn’t have a bear barrel or any good rope to hang our bag in a tree, so instead we put everything in a bag, which was then put into a garbage bag that was sealed tight, and then we put the bag into the portage pack. We placed the pack well away from the campsite and put our pots and pans on top. I was exhausted and fell asleep very quickly. At around 11pm, I was awoken by sounds outside the tent. Laura was awake too. When she noticed I was awake, she told me that something had been rummaging around the campsite for a while. I heard steps and soon enough something rubbed against the tent and gave it a good sniff. Laura and I freaked out a little bit (silently), but the animal left pretty quickly after. We decided it must’ve been a deer (or a moose?) because the steps sounded like hooves. I awoke a few times after that, once from the rain and once from the sound of wolves. There was a howl not too far from camp. The one wolf howled a couple times and then I heard another wolf howl on the other side of the lake. Eventually, I heard at least 3-4 wolves howling in unison. The sound was haunting, but I wasn’t scared at all. I was honestly thrilled to hear a wolf cry in real life. The next morning, I woke up and read Ernest Hemingway’s The Snows of Kilimanjaro and Other Short Stories. I also tried to make breakfast, but failed at starting the stove. I had to ask Laura to help me and soon realized that I had the stove upside down… ops! After we ate, we packed up all of our stuff and headed towards Snipe Lake. There was a 180-something portage. We decided to do two trips again. I started with the canoe, but soon switched because it was pinching my neck and shoulders (due to the reasons mentioned above). So, Laura took the canoe the whole way and I took the portage pack the whole way. Whew, were my legs tired! Along the way, we passed two guys on the trail and they told us that they had just spent the last few days at a great campsite on an island on Snipe Lake. Laura and I were intrigued. We decided to check it out. We reached Snipe Lake and paddled between large glacial rocks and tall conifer trees. Laura also gave me some paddling advice. She taught me the J-stroke, which turns the canoe to the right, and the C-stroke, which turns the canoe to the left. It is useful knowledge because then you can paddle on one side of the canoe, instead of changing sides each time you want to change direction. It is much more efficient. With this knowledge, I pulled out the handy-dandy map and found the island campsite. It was SW of the portage. I used my J-stroke to veer us in the right direction. I slept like a log that night and woke up early for the sunrise. It was misty, which gave the lake a mysterious glow. While I sat and enjoyed the quiet morning, a loon family came around the bend and foraged for food. I watched the adult loon submerge into the water looking for fish, while the juvenile loon waited patiently, guessing where his or her parent would reemerge. It was cute to watch the juvenile float about and then swim very quickly to the parent, hoping that they had caught breakfast. That morning, Laura and I made cinnamon rolls (which were delicious! I will write about this in the camping food post). The weather was cloudy, but warm. I spent most of the day reading, writing in my journal, gathering firewood, and napping on a big rock along the shore. For dinner, we cooked some rice with veggies. When everything was cleaned and put away, Laura and I watched the sunset. The sky was purple and the clouds were a rainbow of oranges and yellows. I could also hear a male loon making his eerie, yet alluring birdsong. Laura and I sat in silence, enjoying the moment. No wonder people love the Boundary Waters so much. It is so beautiful. We woke up early the next morning because we had to return to civilization. We packed up our gear, said goodbye to our campsite, and retraced our steps back to Round Lake. After eating all of our food, the pack became lighter and much more manageable. We decided we could do the portages in one trip this time. We put my daypack in the portage pack and headed off towards the first portage of the day. For the first portage, I took the canoe and I finally found the sweet spot. I carried it the whole way and even did some pretty technical stuff with it. I was impressed with myself. On the second portage, I carried the portage pack the whole way. Even though the portage pack was lighter, it was still exhausting (as you can see in the picture above). We made great time and paddled slowly across Round Lake, so to enjoy our last moments on the water. It was sad to leave, but I am so thankful to have had the opportunity to go and finally witness what all my friends have been raving about. The BWCA is a magical place and I plan on going every summer if I can. I only saw a glimpse of what the Boundary Waters has to offer. Now, I want to see even more! The next time I go up north, I plan on being out much longer than 4 days. 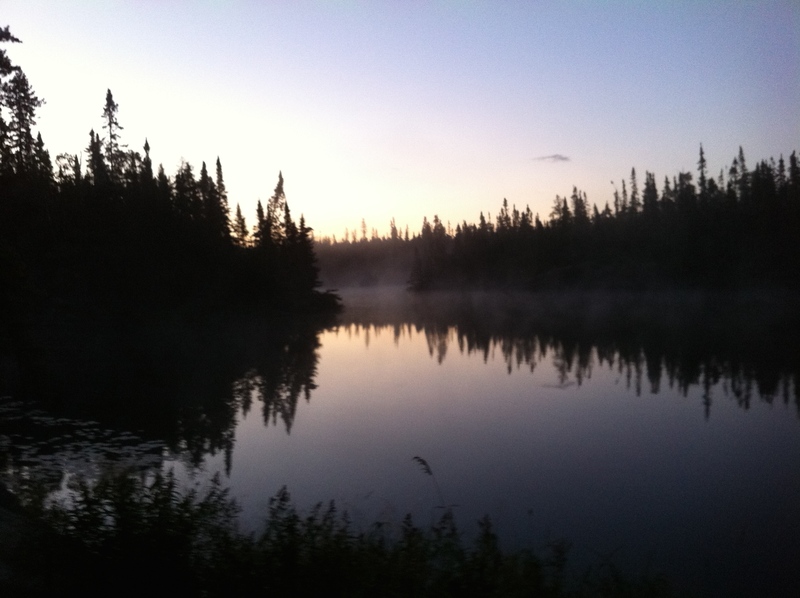 During my time in the Boundary Waters, I had my video camera and plan on making a short film. 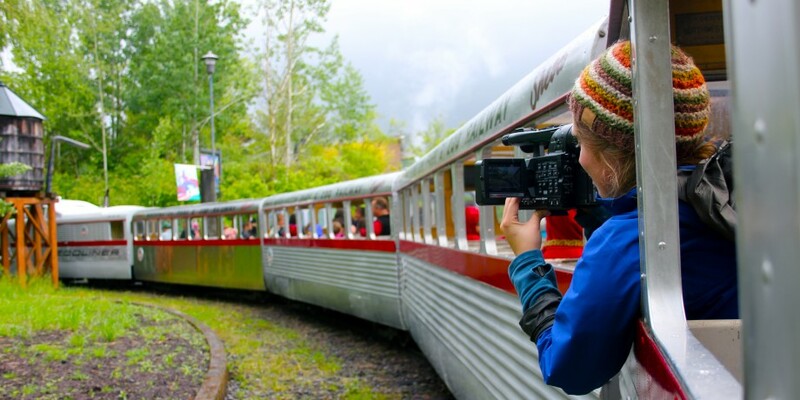 I also want to make a short video on glamorous cooking in the wilderness with Laura. She is a pro at cooking delicious food on the trail. So, the next time you hear from me, it’ll be about those two things. Thanks for reading. I know this was a rather long post, but I hope you enjoyed it. Pizza?! Cinnamon Rolls?! Color me intrigued! I look forward to that post. 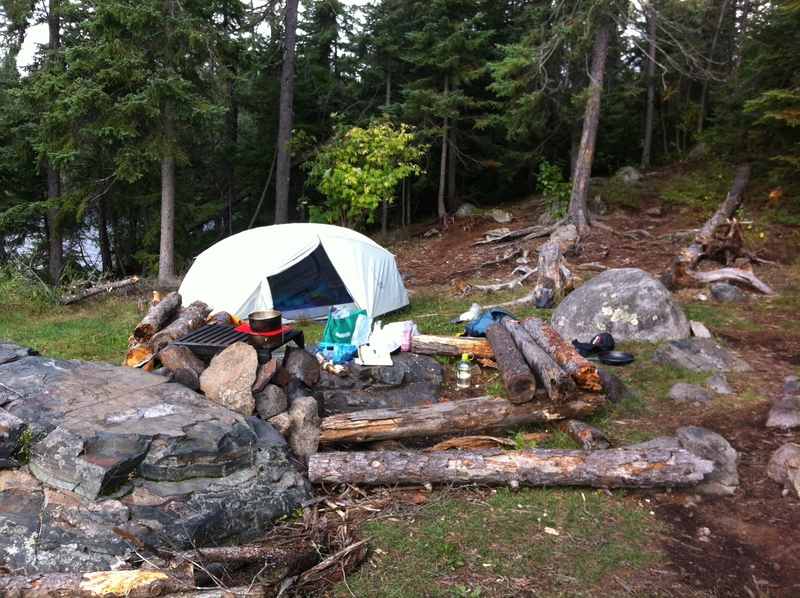 Sounds like the BWCA was amazing – would love to camp up there some time! Molly, I love the language you used to describe your experience. You incorporate such emphasis in nature and animals you stumbled upon. It’s not just your experience, you also describe everything that’s happening around you (trees, animals, plants, etc.) It’s fun to read. Keep up the amazing blogging and adventuring!